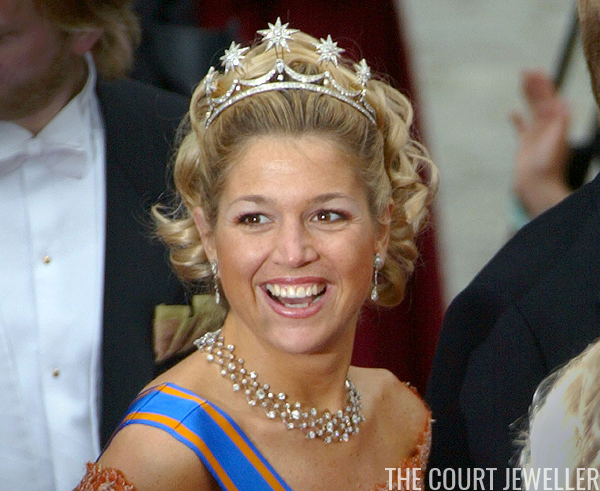 Máxima chose something of a frankentiara -- a piece that features elements of two different items of jewelry mixed together to make a new tiara -- for her wedding day. First, she selected the base of one of the Dutch royal family's existing tiaras: the Pearl Button Tiara (worn above by Princess Margriet). There's a debate about the actual age of the Pearl Button: some think that it was made in the twentieth century, while others argue that its base was a part of a coronet worn by Queen Sophie of the Netherlands, which would make it an earlier creation. 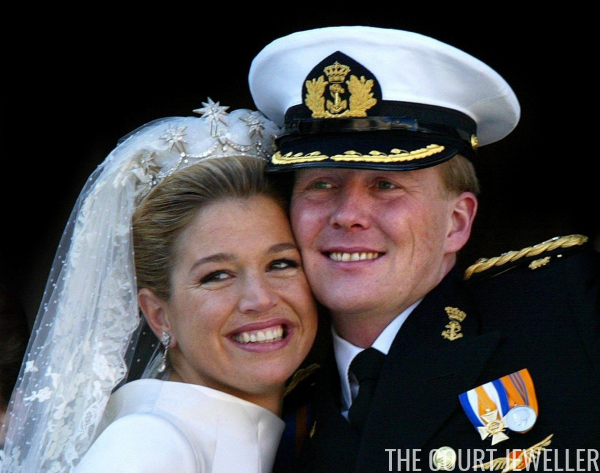 Rather than wearing the tiara with the pearl buttons (like Princess Margriet did at her wedding), Queen Máxima chose to wear it on her wedding day with five of the diamond stars that belonged to Queen Emma. Emma had been given two sets of diamond star brooches when she married King Willem III in 1879. One set has stars with ten points; the other has stars with twelve. 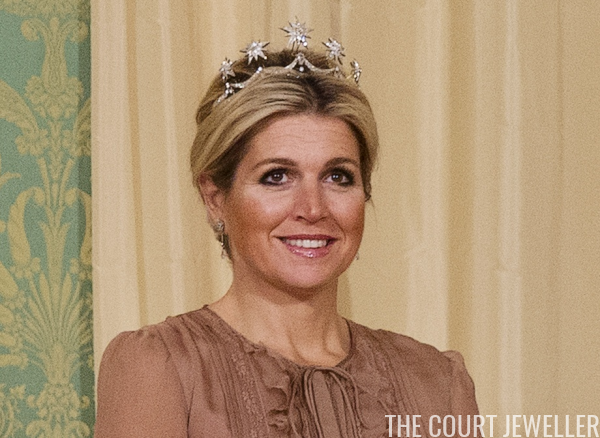 Máxima chose the ten-pointed stars for her wedding tiara. On occasion, she also wears the twelve-pointed stars in other ways, including as pins on order sashes. Above, she wears the tiara at the wedding of Crown Prince Frederik and Crown Princess Mary of Denmark in 2004. Máxima wore the tiara frequently in the early years of her marriage, but in more recent years, she's only worn it for one public outing: a dinner during the 2013 Israeli state visit. 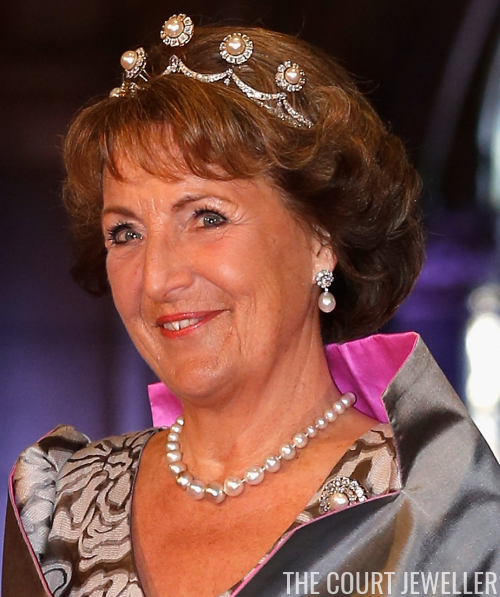 So far, only three members of the Dutch royal family have worn the star version of this tiara: Máxima, Princess Beatrix (who wears it above at a diplomatic reception in 2015), and Princess Margriet. It's not a tiara that every princess could pull off -- you need an element of pizzazz about you to make the stars work. But it's practically perfect for Máxima, who absolutely oozes joie de vivre.